McRae Industries manufactures boots. Combats boots, work boots and Western boots. The company has been in business since 1959 and is still run (and controlled) by the McRae family. 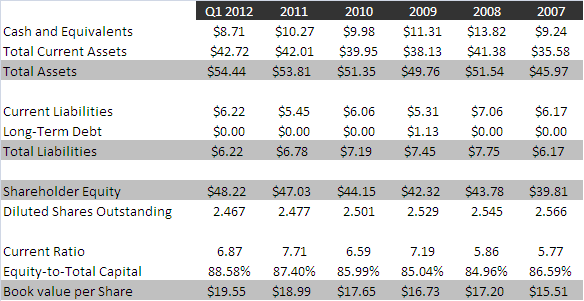 McRae Industries is a stable, profitable manufacturer of necessary goods with a significantly overcapitalized balance sheet, trading at a very modest valuation. The company has had operating losses in only two of the past 25 years. Within the past several years, the company exited an unprofitable bar code reading business and now concentrates solely on boots. The company pays a dividend and consistently repurchases stock. First, a look at recent operating results. Revenues and income have been relatively flat over the last five years, which in itself can be considered an accomplishment. In 2009, the company’s sales of its higher margin Western fashion boots faltered, leading the company to a modest loss. However, the company’s fortunes have recovered and the twelve trailing months period shows the highest revenues and income since fiscal 2008. On the negative side, return on capital continually comes in at an anemic 8% or so. A large part of the reason for this is the company’s extremely conservative balance sheet. To say McRae has excess capital is an understatement. The company has no debt and minimal liabilities, yet it continues to hold 1.4 times its total liabilities in cash alone. If the company were willing to reduce net working capital or take on modest debt and return the excess to shareholders through a special dividend or share tender offer, the value for shareholders could be substantial. 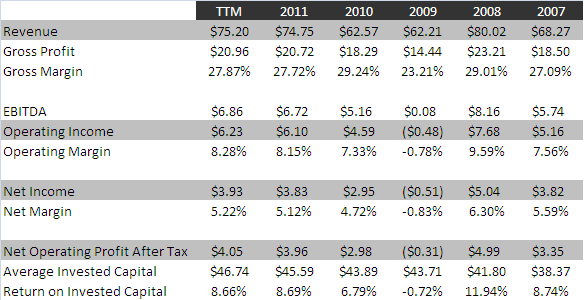 Assuming current revenues and costs are maintained, any recapitalization strategy would lead to improved returns on capital, which could lead the market to assign a higher multiple to McRae’s earnings. Unfortunately, none of these events are likely. The McRaes are firmly in control (owning over 40% of class A shares and over 60% of the super-voting class Bs) and have held excess cash for many, many years. On the plus side, holding this excess capital provides an additional buffer against economic downturns. Investors shouldn’t expect massive returns from McRae, but a 12.3% earnings yield, significantly overcapitalized balance sheet and ongoing dividend and share buybacks make McRae Industries a very strong candidate for conservative equity investors. 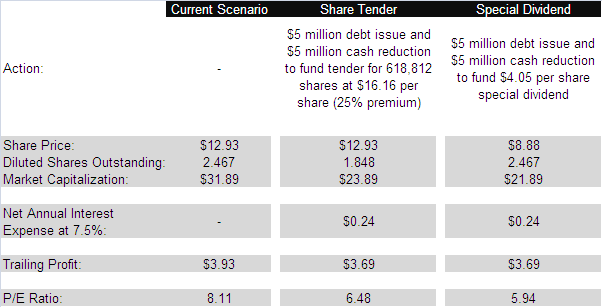 So their diluted earnings is $1.84 / share and basic earnings is $2.22 / share. How is that? Can you explain the math that gets them to those two eps figures? I must admit I am as stumped as you are. No matter how I divide, I can’t get the same figures I see in the 2011 report. Perhaps it’s a typo? For what it’s worth, B shares receive the same dividends as A shares. where shares is either total A shares or total A + B shares for basic and diluted eps. I don’t know why but I recall reading they think that way about earnings in one of their reports. But it is definitely not a typo, it is the same for the summary of the last 5 years. So do you think this is a read flag? I really appreciate your great OTC Adventures website postings. I believe the B shares were entitled to the special one time dividend for 2012. However, they are not entitled to the quarterly dividend of 9 cents. I do not believe they have ever been entitled to the quarterly dividend.